Now more than 50 percent complete, the test program has logged more than 2,000 flight hours. The four test aircraft have undergone full envelope testing, including in hot and cold, high and low, and fast and slow environments. “All of the dimensions of the envelope from altitude to speed to environmental extremes, we’ve taken the aircraft there,” said Bellamy. Mitsubishi has worked closely with the Japan Civil Aviation Board and the U.S. Federal Aviation Administration for full-scale TC testing. “We started flight testing with the JCAB and FAA witnessing our engine rotor lock TC test late last year,” explained Bellamy. “The majority of activity will come in the third to fourth quarter of this year and then into next year. 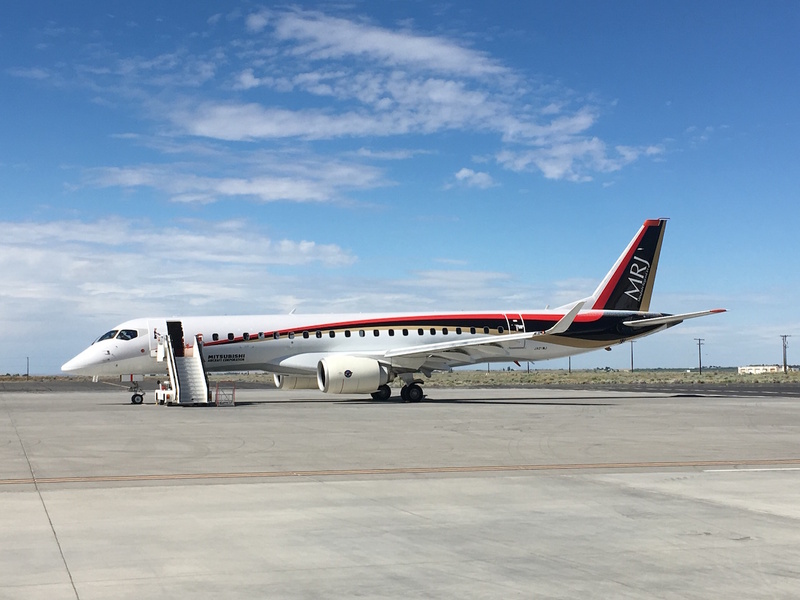 Additionally, the first harnesses have arrived in Nagoya and are currently being prepared for installation.” Bellamy said the MRJ will now undergo the next phase of flight testing, which includes evaluation of runway performance. Most of the orders for the MRJ90 have come from U.S. regionals SkyWest and Trans States Airlines, both of which operate under mainline scope clauses that limit their regional affiliates to jets carrying 76 seats and a maximum takeoff weight of 86,000 pounds. The MRJ90 and Embraer’s E175-E2, although appropriate for a 76-seat layout in a two-class configuration, carry takeoff weights that exceed the scope limits. Of course, Mitsubishi and Embraer hope the airlines can negotiate a relaxation in those limits when the labor agreements of the three U.S. major airlines become amendable in 2019 and 2020. Mitsubishi’s MRJ order book currently lists firm orders for more than 200 airplanes and options and purchase rights covering more than 170. It also holds a letter of intent from a leasing company covering firm orders for 10 airplanes and options on another 10.